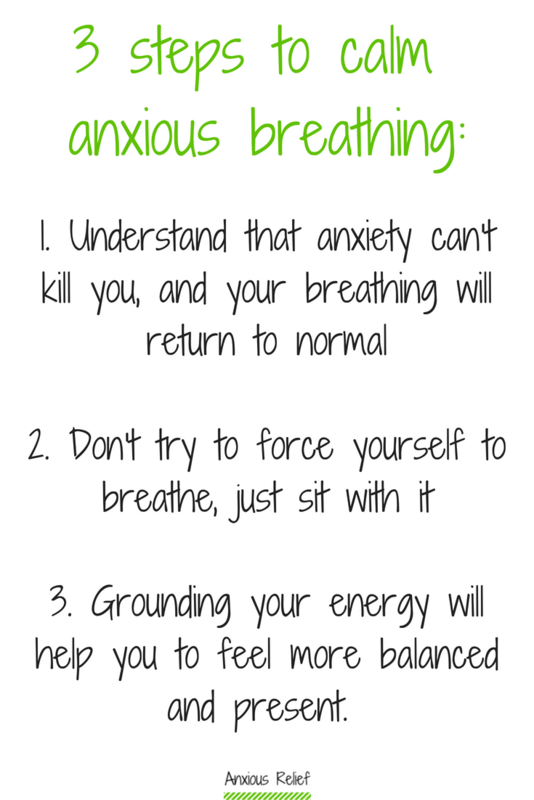 Can anxiety cause breathing difficulties? The short answer is yes, with rapid breathing, inability to take a deep breath and dry mouth and throat being common anxiety symptoms. The good news is – you can calm your breathing by following these 3 steps. Now – when you’re asking can anxiety cause breathing difficulties, I want to be specific about the type of breathing problems that anxiety can cause. And I just want to say if you’re having an asthma attack, generally, you will get other symptoms such as wheezing and coughing. And usually you’ll have been diagnosed with asthma and you’ll have your medications. There is, sometimes in women, getting on about the ages between 30 and 40, sometimes, the increased estrogen that we have can cause late onset asthma. So, if you are getting the wheezing and the coughing and that kind of thing, it is worth going to see your doctors to get that checked out. That being said, the type of breathing difficulties that anxiety causes doesn’t generally have the wheezing or the coughing. So when I’m talking about – can anxiety cause breathing difficulties – what do I mean? So, what I’m talking about is hyperventilation which is when you feel like you can’t get a full and complete breath. When this happens, what’s actually happening is you have taken so many breaths due to being anxious due to being anxious and your breathing rate increasing, you’ve taken so many breaths that your oxygen levels in your blood are too high. So, what your body does is it takes steps to prevent you from taking more oxygen in which makes you feel like you can’t get enough oxygen into your body. It is scary. I have hyperventilated before so I do understand where you’re coming from and I do understand what you’re going through. However, it is something that you can get past. Can anxiety cause breathing difficulties? You might have seen in the movies, they get people to breathe into a brown paper bag and that’s a good way to continue breathing but just making sure that what you breathe out is the same as what you breathe in which means there’s more carbon dioxide as opposed to so much oxygen coming back into yourbloodstream again. So, that’s one way that you can do it. If you are finding that your hyperventilation is happening with a fair amount or regularity and you’re finding that it’s one of the more consistent symptoms of your anxiety disorder, that’s what I want to speak to you about today. I offer natural long term solutions for anxiety and that’s what I want to talk to you today about, when anxiety causes breathing problems for you. It happens not just once, it happens many times and you want to stop that pattern from occurring and reoccurring in your life. When asking can anxiety cause breathing difficulties, I just want you to understand that anxiety can’t kill you. Hyperventilation can’t kill you and even though you might be hyperventilating at this present moment in time, you will get back to normal. Your breathing will stabilize, your breathing will return back to normal. And you will survive it, you always do survive it. Every single panic attack that you’ve ever had, you’ve always survived and that will continue into the future, it cannot kill you, it cannot hurt you. Can anxiety cause breathing difficulties? When it happens, don’t force yourself to breathe. This is what happens with hyperventilation, you feel like you can’t get a full breath so you keep trying to get a full breath. It’s a cycle, it’s a vicious cycle that you’re caught in: can’t get a breath, trying to get more of a full breath, more oxygen in the blood, can’t get a breath, trying to get a full breath. So you just need to – and I know how hard it is – sit with it. You just need to understand what’s going on, understand that you’re hyperventilating and sit with it, allow it to be. Just realize you’re hyperventilating and that once your oxygen levels have returned to normal in your blood, then you’ll go back to breathing normally again and you will feel like you can breathe normally. So, just sitting with it is so important and it also allows you to separate yourself from anxiety as well, that’s important too. You need to be able to say, “I am currently hyperventilating but I am not hyperventilation.” And in saying this, you are not your symptom, you are a separate person who is experiencing an anxiety symptom. Instead of focusing on the question – can anxiety cause breathing difficulties – focus instead on your grounding. This is something that you’re not going to really want to be doing in the moment while you’re actually hyperventilating. This is more one of those everyday habitual practices that I want you to start really bringing into your daily life. Grounding allows you to being your energy back into yourself again. You gather it from where it’s scattered all around the cosmos, you bring your energy back and then you anchor it to the core of the earth, you ground your energy down like tree roots coming out of the soles of your feet and then you bring those tree roots down through the sole, through the earth to connect with the core of the earth. Grounding is so powerful because it just brings you back to you, it gathers you and it really earths you and allows you to become balanced and allows your energy to really calm down and instead of floating around having that wishy-washy floaty feeling, it gives you a feeling of real solidity in yourself and allows you to think more clearly and act from a place of balance and really be aligned in your daily life. Hyperventilation will come on as part of or will cause a panic attack and panic attacks are horrible, as you know, it’s a complete hijack of your body’s fight or flight system and it’s absolutely terrifying, it’s the worst thing that you can feel. However, panic attacks are manageable and over time, you can no longer have panic attacks. That’s completely possible. I used to suffer from panic attacks, not anymore. I have a free panic self-help meditation for you to listen to while you’re actually having the panic attack. So, a great use for this meditation for you when you’re hyperventilating would be when you realize you’re hyperventilating, listen to the panic attack meditation. It will take you on a countdown from 20 down to 1 from which time you challenge your anxiety symptoms and you come out of the panic attack and you’re coming to a place of real empowerment because you’re through it, you’re through the worst of it and you’ve come out of it. So I do recommend that if you’re suffering anxiety and suffering from hyperventilation as a result of anxiety that you do go and download my free panic self-help meditation. Okay, butterfly, best of luck and you will get past this hyperventilation. It’s just another one of those pesky symptoms of anxiety. It’s annoying but it can’t really hurt you.